When our work began in 1950, our approach was simple. We provided food and shelter for children in orphanages through child sponsorship. But we’ve learned a lot in 64 years. Now we offer a full solution to poverty and injustice issues — and make it sustainable so it lasts. We work in the most difficult contexts in the poorest countries, because we believe in the power of transformation. Find out more about our mission and values. Our community development approach empowers children and families to break the cycle of poverty and reach their God-given potential. We love the way Jesus cared for the poor and oppressed, showing us how to listen to children and look out for widows and orphans. Where possible, we partner with local churches, equipping them to meet community needs. As a Christian organization, we serve ALL people, regardless of race, religion, ethnicity, or creed. We are privileged to be welcomed into many communities where Christianity is a minority faith — or barely present at all. In accordance with the Red Cross Code of Conduct, we never proselytize or require a profession of faith in exchange for services. Our hope is to reflect the unconditional and transformational love of Jesus in culturally appropriate ways. Children live in families, in communities, in countries. We work on every level to achieve our goal of child well-being — from international activism to checking in on children face-to-face. Children are the focus of our work, and they are important participants. We invite children to tell us about the problems they see in their communities. We help improve systems and structures to make their world a better, safer place to live. Funding base that we leverage to secure grants, corporate gifts, resources from local governments, one-time donations, and more. This variety of funding sources creates synergy and amazing transformation for the children and the communities where we work. Our local staff members begin working in a community by asking a lot of questions, finding out what problems are seen by members of the community, especially the children. We then address the root causes of poverty and injustice together, designing integrated, sustainable solutions such as access to clean water, a focus on child protection, and opportunities for economic empowerment. Together, we come up with a plan, decide on ways to evaluate and measure success, and get to work. The community is involved, empowered, and trained, and its members take ownership in the programs and progress. Every 3-5 years, we look at the original plan to assess and evaluate our success. If we’re not meeting our goals, we make adjustments and then keep working. We call this our LEAP framework (Learning through Evaluation and Planning). Working together, we can draw on each other’s strengths and make our work more sustainable. We bring together local churches, businesses, community organizations, and other non-profits. We hope this network will keep prioritizing child well-being even after we transition out of the community. Measuring progress is an essential part of our accountability to the communities we serve, our partners, and our donors. We do a baseline survey before we begin work. We design each program to measure progress toward specific child well-being indicators. After 3-5 years, we re-measure those indicators to compare with the baseline. This information helps the community make better decisions and change course if necessary. Along the way, we measure and share results with members of the community so they can be aware and validate changes. The community also provides feedback through qualitative interviews and focus group discussions. 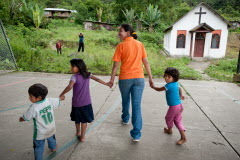 Read more about Our Model for Implementing Programs, and World Vision development programs. These organizations provide independent evaluations of the financial management, program performance, fundraising, and governance of charities. They evaluate charities against rigorous standards to ensure accountability and transparency of their members. 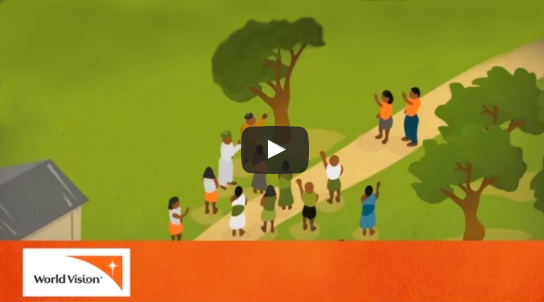 World Vision has been evaluated by and is a member of InterAction and Accord Network. We then address the root causes of poverty and injustice together, designing integrated, sustainable solutions such as access to clean water, a focus on child protection, and opportunities for economic development.